Need a gift idea for your overworked or unemployed friend? 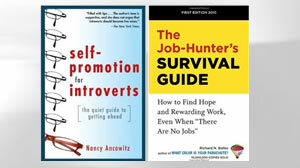 Michelle Goodman recommends books, specifically "Self-Promotion for Introverts: The Quiet Guide to Getting Ahead" and "The Job-Hunter's Survival Guide," among others. Your unemployed BFF doesn't need a new iWhatever, she needs a job. Likewise, your overworked S.O. doesn't need a new sweater, he needs a way to cope with the Everest-like workload that last round of layoffs saddled him with. For this reason, I've compiled a collection of gift books that can help disgruntled job seekers, downtrodden employees and those pining to work from home. Besides being cheaper than a Wii or a Designer Snuggie, a book offers a painless way to tell a loved one that their resume is about as impressive as last year's fruitcake or their management skills are sadly lacking -- and what they can do about it. So herewith, some of the most helpful books for working stiffs published this year. "The Grammar Devotional: Daily Tips for Successful Writing from Grammar Girl"
Is your sweetie constantly confusing "who" with "whom" or dangling his participles? If so, you're right to be concerned about the quality of his cover letters. No one's going to hire him if he can't write a coherent e-mail. Fortunately, Grammar Girl podcast sensation Mignon Fogarty can rectify this situation. Always humorous and never condescending, Fogarty's breezy offering should have your S.O. eliminating those errant commas and properly placing his apostrophes in no time. "Self-Promotion for Introverts: The Quiet Guide to Getting Ahead"
For some job hunters, written communication isn't the problem. Sounding confident in interviews or networking with other industry professionals is. If you have a friend who would rather eat paint chips than toot her own horn (however modestly), I recommend this practical guide from business communication coach Nancy Ancowitz. If Ancowitz can't teach your wallflower pal to dazzle a colleague or hiring manager without sounding like an infomercial pitchman, no one can. "The Job-Hunter's Survival Guide: How to Find Hope and Rewarding Work, Even When 'There Are No Jobs'"
Judging from the number of press releases in my inbox, there have been about 9,000 "how to get a job" books published in the past five minutes. I honed in on this survival guide not because it was written by famed "What Color Is Your Parachute?" author Richard Bolles and loaded with proven advice, but because it's a slim 96 pages -- perfect for those who act too busy (or too proud) to read a full-length career tome. If you have a relative who got the heave-ho six months ago and has made zero headway on their job hunt, this might be the perfect stocking stuffer. "How to Relax Without Getting the Axe: A Survival Guide to the New Workplace"
This is either the scariest or most hilarious business book I've ever read. Fortune columnist and workplace satirist Stanley Bing tells those weary of the corporate hamster wheel how to hop off -- with their paycheck and reputation intact. Among the book's lessons: how to fob off your work on someone else's assistant, how to get sent on business trips to avoid the usual office drudgery and how to create unintelligible PowerPoint presentations so people stop inviting you to meetings. If any cogs you know could use a laugh, this book can help. "Surviving Dreaded Conversations: Talk Through Any Difficult Situation at Work"
If you're anything like me, you know at least half a dozen people who've been complaining about their colleagues and supervisors an awful lot lately. Rather than listen to more of their bellyaching, give them a copy of Donna Flagg's book (complete with scripts for sticky conversations). Then ask them how their Big Talk with that bumbling boss, cunning co-worker or underperforming underling went. "The Power of Slow: 101 Ways to Save Time in Our 24/7 World"
You know that friend who's always 20 minutes late to dinner, checking her BlackBerry incessantly throughout the meal and forever whining about how behind she is at the office? She needs this book. As a member of Christine Louise Hohlbaum's target audience (people who aren't as efficient as they could be), I assure you your friend won't be offended. I'm currently sleeping with my copy of the book under my pillow, as is the friend I gave this book as a holiday gift. The number one question readers ask me is how to find a job they can do at home in their long johns. Countless books have been published on the topic. I should know; I wrote one of them, on how to launch a home-based freelancing business. Of course, the aspiring telecommuters on your holiday shopping list may have no interest in forming their own company and finding their own clients. Instead, they may long to be a full-time or part-time employee who works at their kitchen table. For those friends and family, I suggest "Work at Home Now: The No-Nonsense Guide to Finding Your Perfect Home-Based Job" by Christine Durst and Michael Haaren, founders of the job listing site RatRaceRebellion.com. Among the topics Durst and Haaren cover: which jobs lend themselves to telecommuting (from tutors and transcriptionists to accountants and attorneys), where to find these positions online, how to avoid the many work-from-home scams littering the Web, which companies are telework friendly and how to convince your current boss to let you telecommute. Sure, angora sweaters are softer than books, and yes, they come in those festively wrapped department store boxes that look so great under the holiday tree. But a sweater can't tell your sister or boyfriend how to collect a paycheck or hang onto the one they have -- something they'll need if they ever want to get your gift dry-cleaned.